While Insurance Commissioner Dave Jones has recommended that insurance should be required to cover the “app on, no match” period when rideshare drivers are between fares, that doesn’t seem to have ended the debate – or efforts to further regulate insurance coverage for transportation network companies. Jones earlier this week recommended that the California Public Utilities Commission should refine the definition of “when providing TNC services” to cover the “app on, no match” period and require the $1 million commercial liability policy to apply during this period. CPUC oversees TNCs in California. A spokeswoman for CPUC said the commission is taking Jones’ recommendations under advisement and is planning further discussions. The questions to be answered are numerous. When does commercial insurance start and personal auto insurance stop? How much coverage is needed? How will the livery exclusions in personal policies be dealt with when there’s an accident involving a TNC driver? And here’s a big one put forth by the TNC industry itself while arguing against mandating broader commercial coverage for the ridesharing activity: Will TNC drivers try to game the system so that when in an accident they claim their smartphone ridesharing app was on and that they should be covered under a TNC’s commercial policy? It’s a nationwide quandary that is being dealt with by various states through legislation and regulation, as well as in cities. In California, as in other states, it has pitted TNCs like Uber, Lyft and Sidecar against the insurance industry, and has brought into the fray government departments like the California Department of Insurance and CPUC. Jones made his initial recommendations to CPUC on Tuesday following a CDI investigatory hearing on March 21 relating to insurance issues and transportation network companies. That hearing drew all sides of the debate together to discuss solutions. Several solutions were put forth, but the overriding theme of the meeting was the debate over whether personal or commercial insurance should cover the ridesharing activity. Jones’ recommendation seems to resolve that debate, but only in part. The industry continues to believe ridesharing should be treated as a commercial activity at all times. Chris Shultz, a California deputy insurance commissioner, told Insurance Journal that the recommendation issued by Jones was “initial,” and he said that further recommendations may be forthcoming. Many of the discussions so far have centered around just when a driver is using a vehicle for personal purposes and when the TNC service is being provided. To clarify things, TNCs and CDI have now divided the ride sharing process into three periods for the purposes of the insurance discussion. The first period is when TNC drivers have their ridesharing app on, but aren’t on their way to pick up a fare. The second period is when drivers are on their way to pick up a fare. The third period is when drivers have a fare. Uber developed a graphic to illustrate the three periods. “At a minimum, there seems to be a serious gap in that first period,” Shultz said. Shultz said Jones acted quickly to make the recommendation to prevent a shortfall in coverage similar to the one in San Francisco on New Year’s Eve, during which a TNC driver under contract with Uber struck and killed 6-year-old Sofia Liu. Her family has filed a lawsuit against Uber. Uber issued a statement saying the driver, 57-year-old Syed Muzzafar, was not responding to a fare didn’t have a passenger in his car when he struck Liu. Shultz said he expects further recommendations from CDI and the commissioner to be made to CPUC soon, or even to the state Legislature in the event new laws or amendments to the law are required. Shultz couldn’t say what any recommendations may look like because it’s early in the process. The Property Casualty Insurers Association of America lauded Jones for his recommendations, calling them “a step in the right direction,” but the group still considers TNC drivers to be conducting a commercial activity that should not be covered under existing personal auto policies. 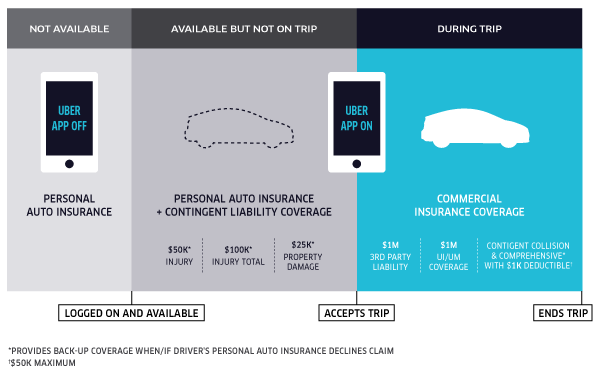 Following pressure from PCI, and local and state governments, over a “gap in coverage” from when a TNC driver’s personal policy and the TNC’s commercial policy kicks in, Uber announced it now has a policy to cover this gap that goes beyond its $1 million commercial policy. Uber’s new policy provides contingent coverage for a driver’s liability at the highest requirement of any state in the U.S: $50,000/individual/incident for bodily injury, $100,000 total/incident for bodily injury and $25,000/incident for property damage, according to the San Francisco-based company. Following that announcement Lyft and Sidecar both stated they were planning on initiating similar policies to cover drivers when they have their apps on, but aren’t providing a ride or en route to pick one up. Jones’ recommendation seems to go along those lines in calling for TNC drivers to be covered anytime they have their app on. While this seems to be a solution of sorts, a capacity problem for this business seems to exist, according to some TNC providers speaking during last week’s hearing, who indicated that there are a limited number of commercial insurers providing coverage and those insurers in the business were reticent to provide it. A spokesman for one of those insurers, James River Insurance Co., which provided Uber with its commercial policy and the latest gap coverage policy, said he considers TNCs an emerging market, although he wouldn’t say if the company was planning on providing coverage to other TNC operators or was developing any new insurance programs to cover TNCs. “The coverage that these companies are asking for continues to evolve,” said John G. Clarke, senior vice president of marketing for James River. Clarke said James River is “not trying to put together a TNC program,” and that it’s merely conducting business under its model as an excess and surplus lines commercial insurance provider. James River has 12 product divisions, including life sciences, allied healthcare and contractors. Clarke said Uber’s policy is written under a standard ISO form. The San Francisco Bay Guardian allegedly was the first to leak this policy and post it online. The lack of insurance capacity, real or perceived, has some TNC operators frustrated. Geoff Mathieux, founder of Wingz, a planned rideshare provider that focuses on trips to the airport, said he’s been paying high commercial rates, which has been hard on his startup business. When he went to market for better rates, he was told by his broker that other players in the business like James River were no longer providing this type of insurance, he said. During the hearing Mathieux had argued against more insurance requirements on TNCs, saying that “99 percent of insurance carriers don’t want to be in the business,” and that James River and other insurers planned to not renew their policies. Clarke said James River isn’t non-renewing, and said the company remains in the business. “The fact of the matter is we’re not, we’re in it,” Clarke said. According to Mathieux, who said he uses Berkshire Hathaway, he pays roughly $5 in commercial insurance per ride given. Mathieux also argues against a “one size fits all solution,” because while app-based rideshare providers like Uber and Lyft are on-demand, Wingz model requires trips to be planned and booked ahead of time. “Drivers cannot get instant ride requests, so they have no need or benefit to be driving around the neighborhoods looking for rides,” he said. “Hovering” and other activities are what PCI and others in the insurance industry say raises the risk of TNC drivers. The industry has argued TNC drivers “hover” around heavily traveled areas, such as urban environments, to be where the rides are so they can be the first to be pinged by the app to pick up a fare. Their argument is that this activity puts drivers in proximity to more traffic and pedestrians than during driving for personal purposes. Taxi and limousine providers, also TNC foes as of late, have also argued that it’s this “in-between period” that’s the most dangerous for drivers. At the hearing it was proposed that personal auto insurers should step up and start offering endorsements on personal policies, or write entirely new auto policies for TNC drivers. No personal insurer has publicly made known they were going to start offering either endorsements or policies for TNC drivers. During a conference call with several insurers more than a month ago Shultz highlighted the opportunity to write more coverage, and he urged those insurers that may be interested in offering such products or endorsements to step up and file with CDI to write these products . “Nobody has filed an endorsement like that yet,” Shultz said. Shultz couldn’t say if any commercial insurers were working on policies related to TNCs, because most of the companies that would offer products to cover this activity are excess and surplus lines insurers, which aren’t required to file or consult with CDI. Uber CEO Travis Kalanick said after announcing Uber’s new policy to cover the insurance gap that the company was working with its insurer to develop more insurance products to cover the ridesharing activity. An Uber spokesman didn’t respond to a request for an update on the progress of that endeavor. A spokeswoman for Sidecar said the company continues to work in its policy to cover the gap beyond its $1 million commercial policy.